We’ve got two exciting home bouts coming up in April so we thought we’d get our geek on and take a look at form for the home and away teams, Wirral Whipiteres and Newcastle Roller Girls’ Whippin’ Hinnies on Saturday 11 April, and the Canny Belters against Leeds Roller Dolls in our British Championships double header on Sunday 26 April. First up, 11 April. The visitors are ranked 65th, while Newcastle’s Whippin’ Hinnies are currently 41st (the second highest ranked B team in Europe) after extending their winning streak in Birmingham this weekend. According to Flat Track Stats’ online predictor, the expected score ratio is 7:11 (i.e. for every 7 points the Whipiteres score, the Hinnies are expected to score 11), and odds are against Wirral with only a 16% chance of winning. 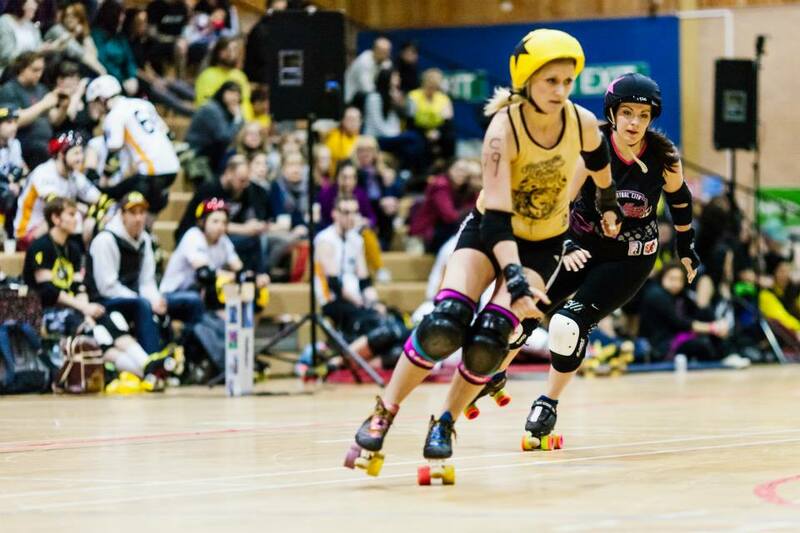 But a closer look at recent bout results shows both teams are on strong form – the Whipiteres only lost two bouts last year and are unbeaten so far in 2015, while the Hinnies took the title at last year’s Great Yorkshire Showdown and were only beaten twice in 2014 by Auld Reekie Roller Girls All Star Reserves and Dundee. Next, we play host to the Roller Derby British Championships where a quick look at the league table shows there’s still everything to play for. The last time these two teams met was the 2014 Northern Series – Leeds took the win with 224 to Newcastle’s 113. A look at Flat Track Stats sees Leeds predicted to win at a score ratio of 5:3 (for every 5 points Leeds score, Newcastle score 3), but the Canny Belters are on a roll – ranked 9th in the UK and 19th in Europe they remain unbeaten this year, with a strong win against Birmingham Blitz Dames in March, a hard fought victory over Hot Wheel Roller Derby in the last leg of the British Championships in Leeds and a convincing win against Manchester Roller Derby to start 2015. Advance tickets for 11 April are just £10 for 2, saving £2 on the door price to spend on beer/cake/stalls. Kids aged 12 and under get in free. And if you fancy a chance to win tickets for our British Champs double header on 26 April don’t forget to grab some raffle tickets! Tickets for Sunday 26 April are now available online. Previous PostLook mum, we’re on the telly!Next PostBelters’ British Champs win & get set for SKOD!